eat, drink & be vegan: Update: Dreena's Hummus Salad Dressing (and recipe)! Update: Dreena's Hummus Salad Dressing (and recipe)! I have an update on the salad dressing - that is, I finally found and tried the Trader Joe's version, and have a report (and a recipe)! But first, I want to thank those of you that commented on my Speedy Momzales post. I was uneasy about that post. But, after reading some comments and e-mails and hearing that it resonated with some of you, I'm really glad I wrote it. So, thank you for sharing your feedback and I if you're a mom juggling everything and reading right now, I hope you feel appreciated and supported and can catch a break sometime for yourself! And, here's a hug from me ((( )))) for giving as you do. Ok, onto food matters. So, you remember from my hummus salad dressing post that I hadn't tasted the dressing, but was feeling pretty cocky that mine would be better. I'm not always so brazen, but, hey, I love me some hummus and I'm not usually impressed by storebought salad dressings. On a recent jaunt to TJ's, I found their hummus salad dressing. I was so excited, I scooped it off that shelf and blazed on through the store. But, when I tried it on one of our dinner salads, I had the same issue I have with most prepared hummus - that citric acid taste. I started making my own hummus because (1) it's far cheaper (2) it's lower in fat/less oily (most storebought hummus brands use a lot of oil and/or tahini and it's very heavy tasting (3) no weird citric acid flavor. That stingy-sort of citric acid aftertaste is in most prepared varieties of hummus, and it stays with you after you eat it. Once you start making your own hummus, it's hard to go back to storebought for that reason. It's like two worlds of hummus-es! And they shall never meet! Yes, I feel strongly about hummus. And, so, I'm sorry to say that when I tried the TJ's dressing, I couldn't get past that citric acid flavor in the dressing. It just tasted like the hummus was thinned out with more water and oil, and so that stingy citric acid-ness seemed more noticeable. With that, I cannot leave you without my own dressing recipe any longer. And, many of you asked for it in the post and through e-mail. So, from my forthcoming book "Let Them Eat Vegan! 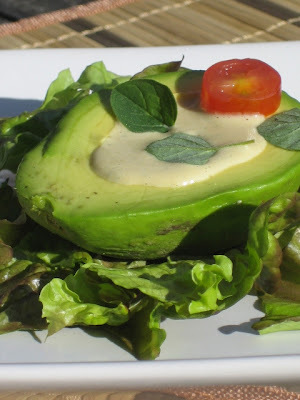 ", here is my Hummus Salad Dressing recipe. Agreed. LOATHE the citric acid in stuff. We don't even buy stuff with ca in it anymore. Looks great-love nearly anything tahini related! I agree - the citric acis taste os vile, hence why i hate packed foods! Betcha anyone who eats commercial hummus will ask "What do you mean citric acid taste?" Thanks for the recipe and I and hundreds, possibly millions, will no longer have citrus acid taste in the mouth for hours on end!! Your dressing recipe looks delicious! I haven't tried Trader Joe's version, but I'm sure I don't need to, even though TJ's really is my favorite place to shop. And there are 2 different guys who work at TJ's who have a crush on me. ;) But I'd shop there weekly regardless! Great book and catchy dressings style. I am really curious to buy this book as soon as. I printed off your recipe last week and was going to make it after work for dinner. I had to stop at TJ's on my way home...had just finished an horribly LONG commute and thought I would just take a shortcut and buy their version of the dressing. All I can say is, YUCK. That acid taste at the end completely ruined it. I can't wait to try your recipe. By the way, your cookbooks completely turned me on to making my own dressings...I don't like store bought at all anymore. I've made your balsamic dressing so many times that the cookbook just falls open to that page! I am unreasonably excited about your new cookbook - just can't wait!! In the interim, some relatives will be receiving EDBV for the holidays!